Teddy Bear Toss Preview: Devils at Bears, 5 p.m.
RADIO: WQIC-100.1 FM, Fox Sports 1460-AM, WOYK-1350 AM, Zack Fisch, the Voice of the Bears and Mitch Lamoureux on the call. The Hershey Bears lost their third consecutive game on home ice last night after falling 4-2 to the Springfield Thunderbirds. 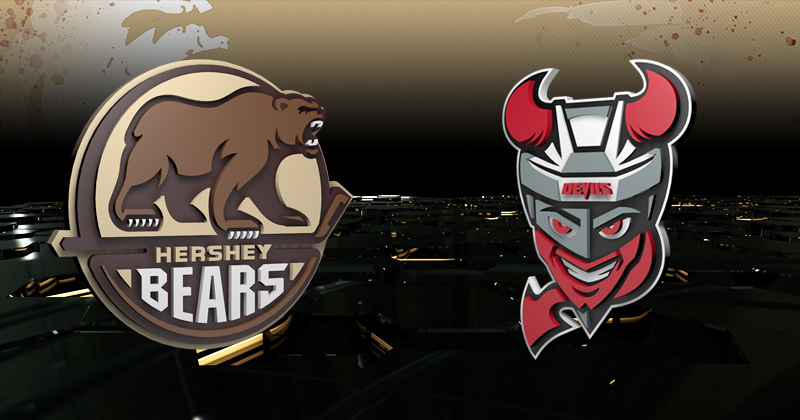 Nathan Walker was Hershey's only source of offense with the game's first goal only 50 seconds in, as well as a second period strike at 6:56 to tie the game at 2-2. After a 1-0 Bears advantage through 20 minutes, the Thunderbirds grabbed a 2-1 lead with goals by Anthony Greco and Blaine Byron 40 seconds apart. After Walker's equalizer, Springfield took a 3-2 lead at 10:08 courtesy of a goal from Jacob MacDonald. Greco added his second of the night at 11:03 of the third period to round out a 4-2 final. The Binghamton Devils enter tonight fresh off a 3-0 victory over the Rochester Americans. Blake Pietila, Eric Tangradi and Nick Lappin scored for Binghamton. Mackenzie Blackwood stopped all 22 shots for the clean sheet. The Bears and Devils only battled twice last season and again will only face-off twice during the 2018-19 campaign. Last season, both teams split their short, two game stretch. First, Hershey won 5-2 over Binghamton on Dec. 23, 2017 at Giant Center. Travis Boyd scored twice, and Zach Sill, Riley Barber and Dustin Gazley chimed in on the score sheet. Vitek Vanecek stopped 31 of 33 shots in goal for the win. Later in the season, the Devils earned a 3-0 shutout win over the Bears on Mar. 10. Tim Kennedy, Bracken Kearns and Kevin Rooney all scored for Binghamton. Mackenzie Blackwood earned the 18-save shutout in goal. Tonight is Hershey’s annual CommunityAid and WGAL Teddy Bear Toss. After collecting a record 25,017 bears last season versus Wilkes-Barre/Scranton, the Bears not only look to exceed their personal record set last season, but the world record of 28,815 set by the Calgary Hitmen in 2015.